EDDIE IZZARD TO CLOSE THE RUN OF THE PRE-DISPOSED on Saturday 19 FREE!! to stay up to date how to be part of the audience follow @stopmyppms gonna be legendary!! 'The Pre-Disposed' will be a Live Storytelling Show that will go to the Edinburgh Fringe '17 as part of the PBH's Free Fringe. 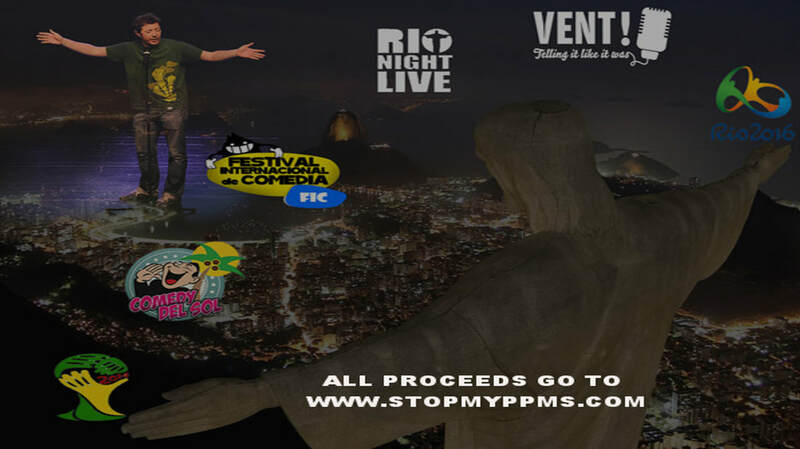 The show will be 30 mins storytelling punctuated by a some underwhelming images which together will frame the story of a search for a diagnosis through comedy festivals in Barcelona and Madrid, Brazil's 2 Mega Events (World Cup & Olympics), Rio's only English language Night out, Rio Night Live and other comedy projects that involved the very biggest names in the comedy industry from Dylan Moran to Eddie Izzard. which I had done and was informed that I should use the more PC term, a Pre-Disposed illness! Each evening I will be joined by a different comedy legend who have mostly directly taken a part in the chronology of the story. The idea is, we will just share the stage to discuss in terms of comedy whether 'the comic' is somehow Pre-Disposed to perform and can it be what defines the comedy style that we the public, all love so much. This list of comics represent for me some of the coalface of Fringe innovation and I am truly honoured that they will join my humble amateurish performance. If you are in Edinburgh, you could do worse than making some of these shows part of your festival plan... Check it out!!! Each evening I will be joined by a different Fringe comedy legend, who have mostly directly taken part in the chronology of the story. The idea is, we will just take the stage to discuss in terms of comedy whether the comic is somehow Pre-Disposed to perform and can it be what defines the comedy style that we all love so much. This list of comics represent for me, are some of the true coalface of Fringe innovation and I am truly honoured that they will join my humble amateurish performance. *** LATE DATE CHANGES!!! we have had to swap Carey Marx and Alexis Dubus around for their guest slot but as of Tuesday (15) the following is all good and we are pretty close to that big T.B.C on Saturday to close this little run. Edinburgh native Andy was one of the original founders of Barcelona's Open Mic scene and has been instrumental in the delivery of Barcelona Comedy Festival over the years. Back home cutting his teeth with a first appearance at the Fringe with an act well honed in the Catalan capital. Danny is a legend of big apple comedy from his years on Comical Radio interviewing the likes of George Carlin to his legendary Modern Day Philosophers podcast. In 2006 was the direct inspiration behind VENT! Telling it like it was, the first live storytelling show in Europe which worked so well in Barcelona and Rio. An integral part of The Pre-Disposed Story in 2015 he returned to perform in Barcelona where he also recorded "The Nicest Boy in Barcelona" which you can buy here!! Already packing a 5 star review from Scotsman!!! Saturday 19 - Told you to watch this space!!! the run will now be closed by the legend and immense human that is Eddie Izzard. This show will be once again FREE but ticketed and the best way to stay up to date with this piece of Edinburgh Fringe history!! When on the ground look out for the Wee Blue Book once the Fringe is up and running which will list all the shows that are part of The PBH's Free Fringe it will contain some amazing shows in some of Edinburgh's best venues. Hurrah now just need to write a show... watch this space!!! !